Have you ever thumbed through a bridal magazine and felt like you needed an on-site translator to decode some of the floral wordage you see? Those of us that work in the floral industry tend to forget that not everyone speaks our language. If you’re not certain if a “corsage” is meant for a man or a woman, or exactly how to refer to those cute balls you’ve seen hanging from shepherd’s hooks, don’t despair — there are a million other brides wondering the same thing! There are a number of terms used to describe various aspects of wedding floral design that are helpful to know during the consultation process, and while you can find wedding glossaries all over the internet, many focus on out-of-date or rarely used design styles which can often lead to confusion and information-overload. In order to combat this, I thought I’d provide a quick overview of some frequently used terms that are specific to floral design and common in our Oklahoma wedding industry. My hope is that this list will help you in your efforts to plan for your event’s needs, and ultimately, better communicate with your floral vendor. Walking flowers: The flowers worn by those associated with the wedding party (i.e., bouquets, boutonnieres and corsages) Also referred to as bridal party flowers, personal flowers, wedding party flowers. Bridal party: The individuals that are an integral part of the wedding ceremony. Depending on the location, religion, and style of the wedding, this group may include the bride, groom, maids of honor, bridesmaids, best men, groomsmen, flower girls, ring bearers, and in Oklahoma, immediate family members. Also referred to as the wedding party. Corsage: Flowers worn by the important women in a bridal party. Either pinned on the woman’s dress, or worn on her wrist (wristlet). Boutonniere: Flower worn by men in a bridal party, pinned to the lapel. Pomander: A compact ball of flowers, either hung by ribbon or positioned on top of an object. May be constructed in a variety of sizes. Often carried by flower girls or hung from hooks to enhance a wedding’s décor. Also referred to as a kissing ball. Halo: Ring of flowers worn on the head. Hand-tied bouquet: The process of arranging bouquet flowers by hand and securing the bouquet at the stems with ribbon, lace, twine, or a variety of other materials. Cascade bouquet: The process of arranging blooms in a foam bouquet holder. This style typically has a variety of cascading greenery or flowers at the base of the bouquet. Wrap: The material used to bind the stems of a hand-tied bouquet. Clutch: Extra-small-sized, hand-tied bundle of flowers. Focal piece: Large arrangement of flowers usually placed in a very prominent spot such as on a buffet table or at the front of a ceremony. Pavé: A contemporary style of arranging flowers where the blooms of the flowers appear to be sitting atop the mouth of the vessel in a grid-fashion. Monochromatic: Colors found in an arrangement are all (tints, tones and shades) of a single hue. Monobotanical: An arrangement that contains only one variety of flowers. Deconstructed: The practice of using the varieties of flowers found in the bridal bouquet to create a different monobotanical bouquet for each attendant. 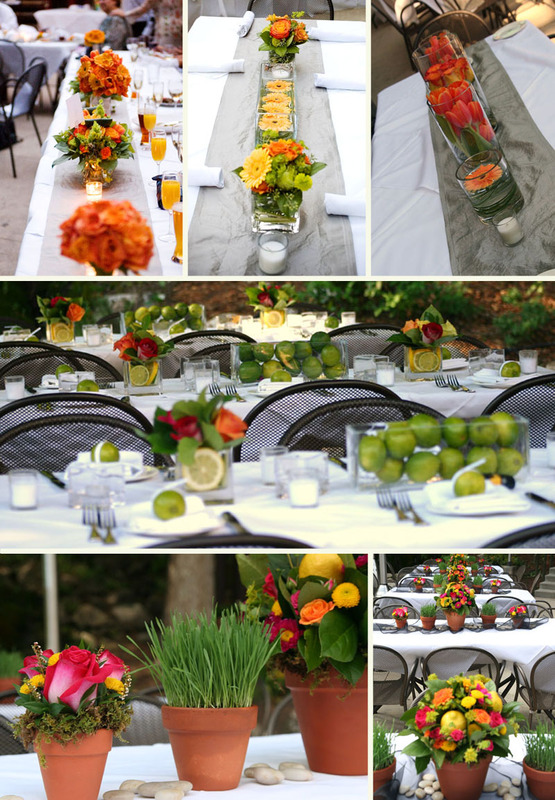 Centerpiece: Floral arrangements placed on the eating tables to decorate a reception venue. Toss bouquet: An alternate bouquet used during the tradition of “tossing the bouquet” to unmarried women. Allows the bride to preserve her wedding bouquet. Chuppah: Also spelled, huppah. A canopy decorated with flowers that is part of the traditional Jewish ceremony. Topiary: A miniature tree made from flowers and greenery. Wreath: Usually hung on doors, a wreath may be a variety of shapes and may be decorated with flowers or greenery. 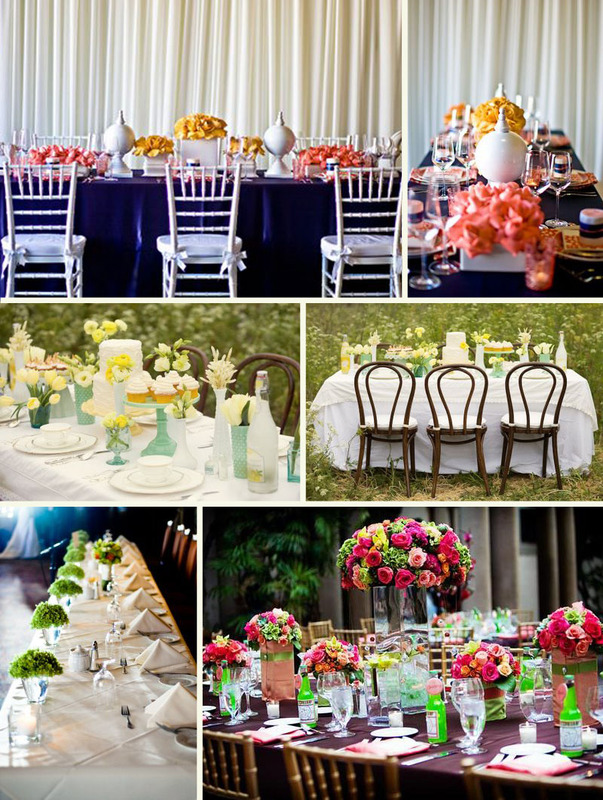 Event Breakdown or Strike: Time appointed for a vendor to return to the venue at the close of the event to clean up and retrieve rental items used during the wedding. Draping: The term used to describe the use of materials/linens/decorative fabric to decorate or dress a table, arbor, or other structure. …Are there any florists reading who would like to add to this list in the comments section? Visit places special to each of you and share your stories. So now you’ve found some amazing florists, what do you do now? We are going to talk about what happens when you do find a few and how to have a successful consultation. If you have chosen a shop to consult with make sure that your consulting with the employee or designer in the shop that will be working on your event. If you have chosen a designer its likely that you will be meeting with the designer working on your event already and in an office rather than a shop. Expect a thorough consult to take at least an hour maybe even two and for it to include a basic event interview, a question & answer period, review of portfolio if needs be, some flower and design selection, and a review of contract. A lot of florists will tell you what they want you to bring when setting up the appointment but it always helps when the client comes extra prepared to give their designer a more accurate picture of what they want and what they are trying to create. Make sure to take pictures, magazine cut outs, anything image related of everything & anything wedding you have collected. Pictures of things seemingly not floral related really do help a designer determine your style. A picture of the brides dress & bridal party attire colors are helpful in coordinating things, it’s also important to have a preliminary count of your bridal party members. Swatches are crucial, there are dozens of shades of pink for example so its best to be exact in what you expect for color. Pay attention to the florists level of attention to you, do they seem interested? Are they professional and friendly? Do you like their personality? Do you think you will be able to work well with them and create a vendor friendship during the planning process? It’s really important to actually like the people you are working with to create your dream. Make sure you make a list of your expectations and desires from your florist and review your list even if only in your head to see if the florist is well suited to your needs. Don’t be afraid to ask questions! A good designer will have a contract, and believe me you want this contract too! If there is no contract you should be worried! It protects you just as much as it does the vendor. Some brides know right there in consult or even before consult who they want to address their floral needs, others need some time to think about it,and either way, make sure that if you have a weekend wedding or prime wedding season wedding that you are prompt in your decision so you don’t lose who really suits you best! Make a blanket tent in the house!